If you want to share an Office document on the web, you will either upload it to a document sharing website (like SlideShare, Scribd or even Google Docs) or, if the content is private, you’ll probably send a copy of the document as an email attachment. Now there’s another neat alternative that you should explore. Microsoft has launched a new document sharing website – docs.com (brilliant name) – that lets you both create and share Office documents in the browser. The service is powered by Office Web Apps and the Facebook Connect platform. 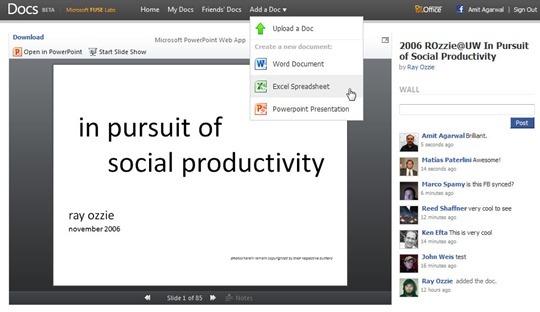 With Docs.com, you can not only upload Word documents, PowerPoint presentations and Excel spreadsheets to the web but it also adds a social layer around your documents. Your Facebook friends can comment on your Office documents (see the next screenshot), they can view your documents in the browser (without requiring the Office software on their desktop) and there’s also an option for them to download your documents in the original formats. There are proper privacy options in Docs.com so you can keep your documents private (for personal consumption only), share them with a select number friends or even make them public. Similarly, you can add your Facebook contacts as collaborators so that all of you can work on the same document in the browser. Such a thing is also possible with Windows Live SkyDrive and Office 2010 but with Docs.com, all you need is a Facebook account to get started. Office 2010 is completely optional and you also don’t a Windows Live ID for using Docs.com. The Docs.com site is live and though you can login into the site using your existing Facebook ID, some of the features (like uploading and commenting) aren’t working yet. For more details, check out the Docs blog.